We are a thermal interface material manufacturer, die cut converter and designer of thermal management materials for electronic cooling. We offer an extensive line of standard thermal management materials as well as custom thermal material formulations, constructions and die cut designs targeted towards specific thermal application requirements. Our standard thermal management products are readily available in rolls, sheets or die cuts designed to meet your various thermal performances or installation process objectives. 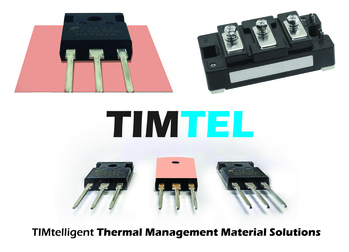 Timtel is your one-stop die cut converter for all your pre-form thermal requirements. In addition to bulk log rolls of our materials, we offer full die cut converting for our own manufactured thermal management products in multiple delivery formats (die cut individuals, multiple die cuts per card or die cut continuous reels).